McDonald’s posted an excellent set of results this morning and the quality of the reported earnings was very high because it came at an abnormally high tax rate. McDonald’s global same store sales came in at 5.0%. The results continue to confound many analysts and investors who fear that McDonald’s growth is not sustainable – in short it is sustainable. 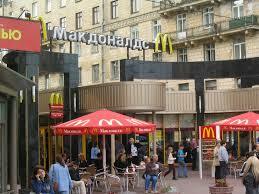 McDonald’s posted 4.9% same store sales in Europe and also indicated that September comp sales in Europe were up 6.9%. This strength of McDonald’s business is in Europe is rather stunning given all that is going on in the world. Perhaps the French are trading down from the brasserie and the German’s from the schnitzel and sausage houses (but I believe there is more to it than this). McDonald’s called out European sales strength in Germany, France, Russia, and the UK. In addition to strong trends through Europe, the US exhibited a 4.5% same store sale and Asia 3.4%. Within the Asia region, Japan was called out as negative, so presumably the Asia-Ex Japan remains robust. There are numerous drivers of McDonald’s sales growth. The restaurants are continually refurbished and McDonald’s regularly invests capex in company operated units. Menu innovation is at the fore-front of the fast-food industry (I mean this seriously) as breakfast has been expanded with items like oatmeal. More importantly, McDonald’s developed a large beverage business through expanded coffee (McCafe) as well as smoothie offerings. Aside from the sales strength, McDonald’s is controlling payroll, benefits and occupancy costs well. About one-third of the operating profits come from company owned restaurants and two-thirds from the franchise units. The franchise program is a leader and McDonald’s has grown their franchising at a fast rate while improving the profitability of the entire operation. Franchise operating margins have exceeded 83% this year which is a new all-time high for the company. McDonald’s buys back shares regularly with free cash flow and all this has translated to steady 12% type earnings growth. On the current quarter, I’ll note that the tax rate was up from a normalized 30% to 33.4% which cost EPS about $0.06. McDonald’s results are consistent with the global business environment being good but not great. In this type of environment the best companies with strong brands can perform quite well. The environment around the world is nowhere close to a recession. The key global risk factor which remains is simply the prospect for a European financial catastrophe – which can 100% be avoided if the political will in Europe is there to do so. We’ll learn a lot on this front over the weekend through Wednesday of next week. I will get more bullish when the ridiculousness from Europe can be taken off the table.